WarpDisk is basically just a defragmenter, but not like any other defragmenter. Conventional defragmenters are user applications or services that scan the entire disk for fragmented files and then defragment all the fragmented files found during the scan. WarpDisk, on the contrary, is a file system driver encapsulating the file system, providing it with fragmentation prevention capabilities. Furthermore, WarpDisk also comes with a unique Windows boot optimizer, dramatically reducing the time it takes for Windows to boot. Behind the scenes, during boot, WarpDisk reads files ahead and saves them into a memory buffer for fast access. There is no conventional defragmenter application to run. WarpDisk does, however, come with the user application WarpDisk Control Panel for monitoring and configuring WarpDisk. The image below shows the graphical volume map of the current fragmentation status. Screenshot of WarpDisk Control Panel (click to view large image). WarpDisk makes Windows boot much faster. When Windows has finished starting you will be notified of the improvement. Screenshot of the boot improvement notification window. Because WarpDisk runs in the context of a file system driver it has a lot of advantages over conventional defragmenters. This is a summary of the most important features of WarpDisk. Because WarpDisk is a system driver it inherently has many advantages over conventional defragmenters. One is that it is possible for WarpDisk to defragment system files unmovable to other defragmenters. The page file cannot be defragmented by conventional defragmenters, at least not with Windows 7. WarpDisk will defragment the page file during boot if it is fragmented. Because WarpDisk is a file system driver, fragmentation is detected immediately when it occurs, and defragmentation can commence immediately. Not like conventional defragmenters that have to scan the entire disk every time they run a defragmentation session. All reads and writes to the disk are intercepted by WarpDisk. For that reason, WarpDisk knows exactly when a user application uses the disk. This allows Warp Disk to immediately bring all work to a halt when the disk is accessed. Consequently, WarpDisk runs in complete stealth. Conventional defragmenters run as user applications often consuming vast amounts memory. On the contrary, WarpDisk is a file system driver with a very low memory footprint. Most of the files read during boot are the same every time you turn on your PC. WarpDisk will read those files ahead when you boot Windows, that is, before they are needed. This will often cause Windows to boot twice as fast! There is no conventional defragmenter application to run. WarpDisk does, however, come with the user application WarpDisk Control Panel for monitoring and configuring WarpDisk. The features include a fragmentation history log and a graphical volume map of the current fragmentation status. An icon is displayed in the notification area of the task bar. The color will indicate the fragmentation level of your disks. WarpDisk will regularly check for software updates so you always have the latest version installed. You don't need to be a computer expert to use WarpDisk. Just install WarpDisk and let it do its work. That's it. When you install WarpDisk for the first time you get a 30 day evaluation period. There are no restrictions or features lacking during that period of time. WarpDisk makes a slow PC run and boot fast by optimizing the boot process and doing defragmentation behind the scenes. This is a technical description of how WarpDisk accomplishes that. It is a well-known fact that file system fragmentation degrades the performance of your disk and, on top of that, Windows takes a long time to boot on many systems. Both problems have to do with the way file systems operate. But why is that? And how does WarpDisk solve those problems? NTFS is the preferred Windows file system. NTFS stores file data in small units called clusters. Large files may occupy thousands of clusters. The ideal situation is to have the clusters of each file stored contiguously on the disk. This allows for rapid sequential file reads and writes. If each cluster of a file is placed right after the previous cluster, then the entire file can be read in a single progressing operation. On the contrary, if the clusters are scattered around the disk, then the read operation must be divided into several smaller chunks of disk reads, which will slow down the read significantly. This is called file system fragmentation. Fragmentation is bound to happen as files are added, removed, and changed in size, because the free space becomes fragmented, leaving only small holes in which to place new data. Windows often takes a very long time to boot. The reason for this is actually somewhat related to file system fragmentation. The primary bottleneck during Windows boot is the file system. As the boot progresses more and more processes are created that simultaneously read from the disk. The file system will attempt to satisfy all read requests by dividing them into several smaller read operations. Consequently, the disk reads will be scattered around the disk. Just like when reading from a fragmented file. WarpDisk addresses both these problems. No other single software solution does that. Traditionally, defragmentation software are user applications or services that either run on demand or at certain intervals. WarpDisk takes a brand new approach. Ideally, the file system should take care of keeping its files defragmented. This is not the case today; at least not with the NTFS file system. WarpDisk effectively extents the NTFS file system with fragmentation prevention capabilities and read-ahead boot caching. Figure 1 depicts how this is done. The figure is a simplified view of the file system architecture with WarpDisk installed. When a user application accesses the disk the request passes through layers of drivers that send I/O requests to each other. The figure shows how WarpDisk encapsulates the NTFS file system driver. The Defragmentation Driver above takes care of fragmentation prevention. The Boot Cache Driver below does the read-ahead caching during Windows boot. Figure 1 - File system architecture with WarpDisk installed. The blue boxes are the WarpDisk components. Figure 1 also depicts the two contexts that software runs in: user mode (green) and kernel mode (red). User applications executes in user mode, whereas operating system drivers executes in kernel mode. User mode refers to an execution state in the CPU in which individual processes cannot access memory or program code in other processes and do not have access to all CPU instructions. Kernel mode refers to an execution state in the CPU in which all system memory and all CPU instructions may be accessed. Operating system drivers also control which information users and applications can access. Conventional defragmentation software runs in user mode, whereas WarpDisk runs in kernel mode inside drivers. This inherently provides WarpDisk with a range of advantages over conventional defragmentation solutions. A disk defragmenter runs in user mode and may only defragment a file by interacting with the user subsystem. First, the file is first opened, then a number of MoveFile requests are executed, after which the file is closed again. If the file is locked by another process, or the disk defragmenter does not have sufficient privileges to open the file, it cannot be defragmented. WarpDisk does not have this intrinsic problem. It can defragment locked files and system files that user mode application defragmenters cannot. Only a few protected operation system files are unmovable to WarpDisk. A disk defragmenter does not discover a fragmented file until the application is run. The very first thing a disk defragmenter does is to scan all files for fragmentation. In other words, files may be fragmented for a long time, if the user is not in the habit of running the disk defragmenter regularly. Files that are used often may be severely fragmented without knowing. Since all I/O requests pass through the Defragmentation Driver, all I/O requests that may cause fragmentation are intercepted. It may for instance occur when a file is created or when it grows. Fragmentation is immediately detected and defragmentation can commence immediately. A disk defragmenter slows down other applications accessing the disk, because it has to share the disk with other applications. The disk defragmenter competes with other processes about getting its I/O requests through. 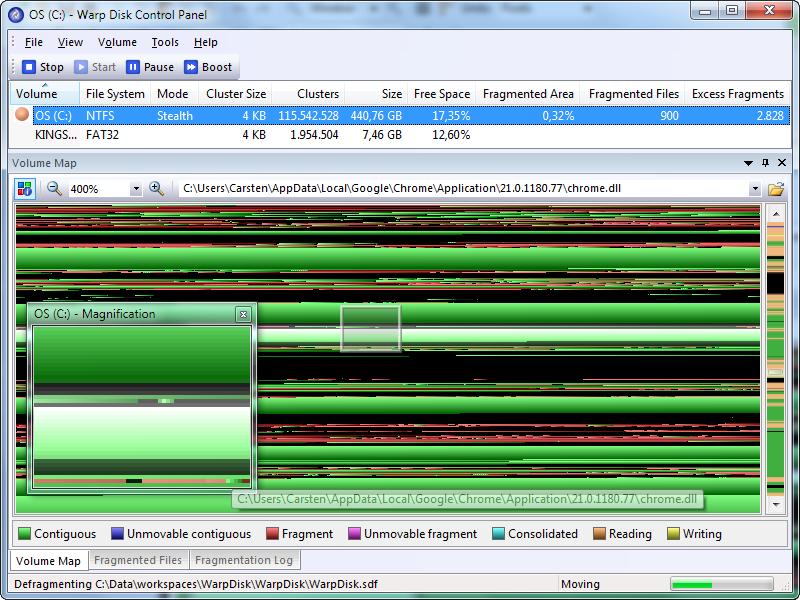 Even though many disk defragmenters claims to slow down when disk activity is high, it doesn't always work that well. Furthermore, if another process tries to delete or exclusively lock a file being defragmented that process will fail, because the disk defragmenter has an open handle to the file. WarpDisk encapsulates the file system driver and therefore knows exactly when the disk is active and in which pattern it is active. For that reason, WarpDisk can determine when it is safe to do defragmentation without degrading system performance. In addition to that will WarpDisk not prevent a file from being deleted or locked while defragmenting. A disk defragmenter typically does defragmentation on demand or at certain intervals. This is cumbersome and doesn't keep the file system defragmented at all times. WarpDisk doesn't have this problem. It is always on. Even though WarpDisk comes with the user application WarpDisk Control Panel, it is only for monitoring and configuration. The disk is heavily used during Windows boot. All code and data necessary for Windows to run must be loaded into memory. Late in the process are a great number of executable images loaded almost simultaneously, and many of those executables start by reading libraries and configuration data from disk. Needless to say, this induces a great burden on the disk. WarpDisk mitigates this problem by reading data clusters known to be read during boot ahead. That is, before they are requested. In that way the clusters can be read from disk in a more orderly and efficient manner. Fixed endless loop when defragmenting page files. Added option to defragment page files. Partially fragmented page files are now allowed. Fixed system crash when mounting unusually formatted NTFS volumes. Fixed system crash when mounting FAT volumes. Fragmentation monitoring occasionally got stuck in an endless loop. Improved stability on volume mount and dismount. Windows occasionally hung or crashed after dismounting a volume. Solved issue that prevented ejection of USB devices. Solved failure to run chkdsk during boot. Fixed WarpDisk Updater connection issues. MFT$ defrag occasionally looped infinitively. Added scroll bar to Option dialog to allow multiple volumes. Changed sorting of volumes in Option dialog. System would occasionally hang after boot. A page file reference prevented the creation of dump files after a system crash. Page file defragmention messed up boot statistics. Boot was getting increasingly slower. System would occationally hang after boot. Stopping monitoring caused boot statistics to get out of sync. 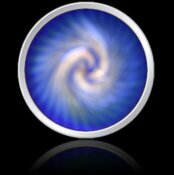 Warp Disk was renamed WarpDisk. Upgrade always created all shortcuts. License was disabled on first boot after upgrade. Update notifiction window appeared twice. Changed volume sort order in Warp Disk Control Panel. Check for software updates did not work on some systems. The option not to monitor for fragmentation on mount did not work. Volumes having multiple partitions caused system failure on rare occations. Silent install on x84 platform created invalid shortcuts. The driver installer failed to verify digital signatures on Windows XP and Windows Vista. Systems with multiple disk partitions would sometimes crash during boot.